We invite you to join us in tracking the “green wave”—the flush of green that accompanies leaf-out–-over the course of the spring season, as well as the spread of seasonal color across the country in the autumn. Observations of these trees are of extra importance because they can help decision makers develop forecast models and early warning systems for use in forest management and public health administration via pollen forecasting. 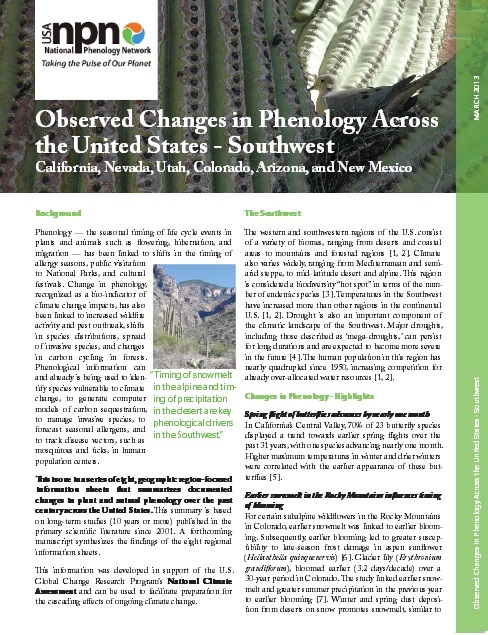 In fact, researchers are already using data that have been reported for these speciesto validate models that predict how changes in climate will impact phenology of trees, and also to learn that deciduous trees may leaf out weeks earlier under climate warming. Join us for this special campaign! Make it easy on yourself...choose that tree that you see every day - either the one in your yard or the one you pass each day. Observations from just one tree can help fill critical data gaps! 1. 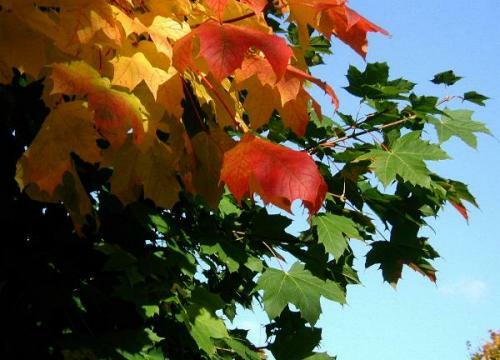 Select one (or more) individual maple, oak, or poplar trees to track from the list below. Species marked with * are of special interest for your region. Don't have one of the target species at your site? Your observations are still valuable! 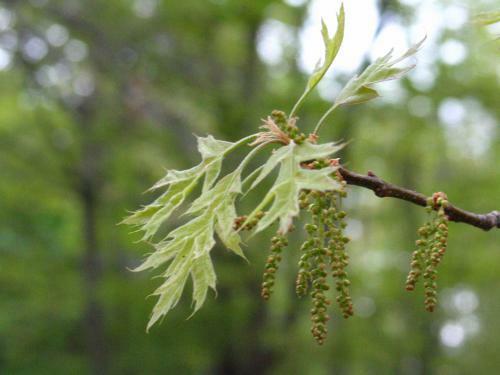 select from our list of many other maple, oak, or poplar species for which we have protocols. 2. Join Nature's Notebook. If you haven't already, create a Nature's Notebook account. See our specifics of observing if you need more details on getting started. 3. Sign up to receive our Green Wave campaign messaging (in the right sidebar of this page - you may need to scroll back up to see it). You will receive messages approximately every 4-6 weeks during the growing season, providing early results, encouragement, observation tips, interesting links, and campaign-specific opportunities. Don't miss out! 4. Take observations. 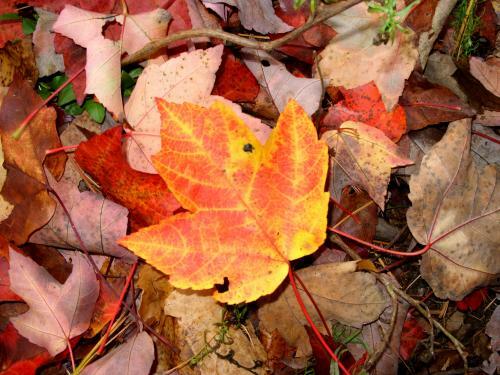 We invite you to track leaf out in your trees ideally 2-4 times a week, in the spring and autumn. We are especially interested in the following phenophases, though you are welcome to report on flowering and fruiting as well. Breaking leaf buds One or more breaking leaf buds are visible on the plant. 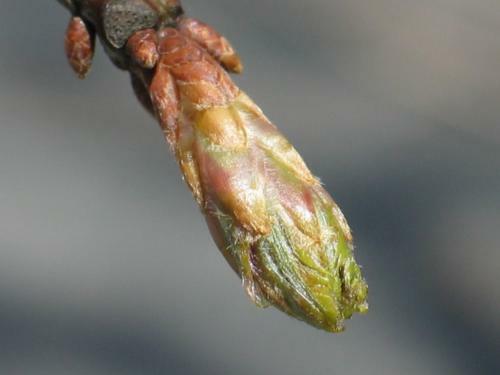 A leaf bud is considered "breaking" once a green leaf tip is visible at the end of the bud, but before the first leaf from the bud has unfolded to expose the leaf stalk (petiole) or leaf base. Leaves One or more live, unfolded leaves are visible on the plant. A leaf is considered "unfolded" once its entire length has emerged from the breaking bud so that the leaf stalk (petiole) or leaf base is visible at its point of attachment to the stem. Do not include fully dried or dead leaves. Increasing leaf size A majority of leaves on the plant have not yet reached their full size and are still growing larger. Do not include new leaves that continue to emerge at the ends of elongating stems throughout the growing season. Colored leaves One or more leaves (including any that have recently fallen from the plant) have turned to their late-season colors. Do not include fully dried or dead leaves that remain on the plant. Falling leaves One or more leaves are falling or have recently fallen from the plant. 5. Report your observations. As you collect data during the season, log in to your Nature's Notebook account and enter the observation data you recorded. You can also use our smartphone apps to submit your observations! 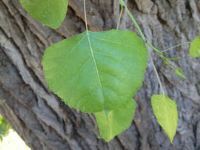 You reported breaking leaf buds for boxelder, quaking aspen, and Fremont cottonwood at about the same time in 2016 as in 2015, which also had a winter with temperatures much above average. 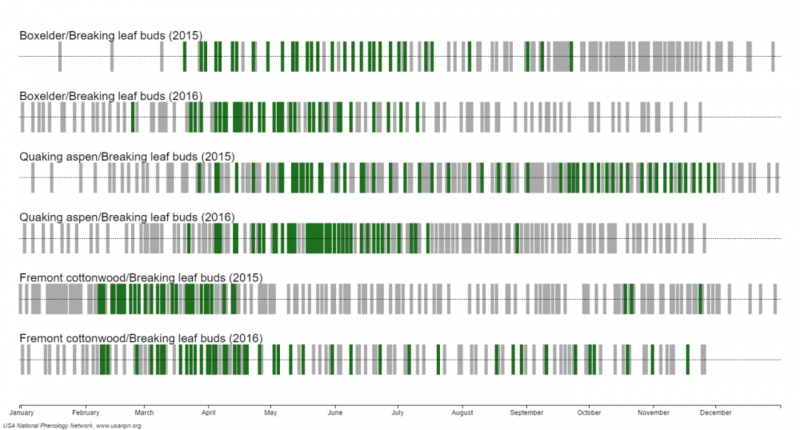 The phenology calendar below shows your reports of breaking leaf buds in boxelder, quaking aspen, and Fremont cottonwood in the Southwest for 2015 and 2016. Green bars indicate "yes" reports, while gray bars indicate "no" reports for that phenophase. Your reports of colored leaves for boxelder, quaking aspen, and Fremont cottonwood do not show a clear difference between 2016 and 2015. 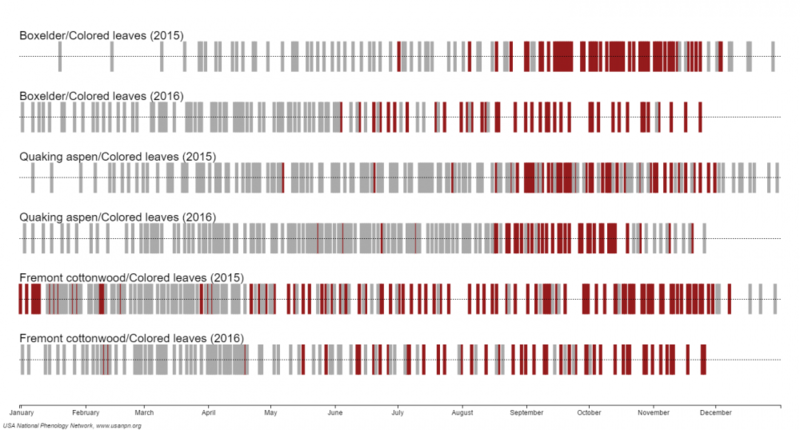 Both years had summers that were warmer than average (1895-2016 average, NOAA.gov). The reports of colored leaves throughout the rest of the year could be due to trees changing color due to stress from drought, which persists in many parts of the Southwest. Sign up for campaign messages! You will receive messages chock-full of findings, observation tips, and campaign-specific opportunities. Don't miss out! What did this campaign reveal last year? 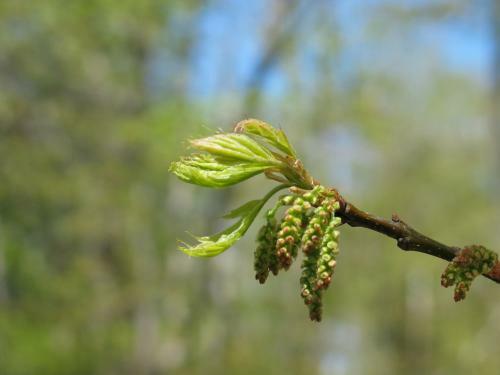 We invited Nature's Notebook participants to start tracking maples, oaks, and poplars in 2013, and we plan to keep efforts focused on these species for the next several years. See what observers reported in your region last year. How will this year stack up? 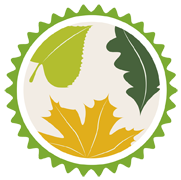 You can earn this badge by observing one target maple, oak, or poplar tree in six separate weeks, within the same year. See it on your Observation Deck.